The Sartorialist started his blog to give himself ideas about his wardrobe. He saw someone on the street whose rig he admired and took a shot. He figured that others might benefit from his hobby. He was right. He shot a window (in Milan) that inspired me. 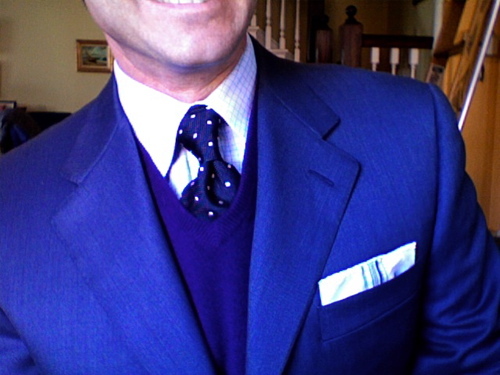 Blue blazer, purple sweater, navy tie. A colour combination that would not have occurred to me. Purple and grey? Sure. Blue and purple? Hmmm. But the mannequin looked fantastic. We’ve been having rather dramatic weather recently. Yesterday could be described as “brooding.” Or with Uncle Monty’s quote above. It had me thinking about purple and navy and black. My take. Blue suit and shirt, deep blue tie and a purple sweater. And that’s why other blogs continue to inspire me to try something new — be it inside the house, at the stove, or looking at my wardrobe in a whole new light. This entry was posted in Elegantology and tagged purple, The Sartorialist, Uncle Monty, Withnail & I. Bookmark the permalink. Personally, I think it’s an enchanting combination. One I myself often choose. super tie with this combo as well – and very well knotted. I have on occassion opted for a lavendar and white striped tie with subtle navy pinstriping with a midnight blue suit and white shirt and quite liked the look, as did quite a few of my co-workers as lavendar ties began appearing in the halls with some frequency. Now I see that if I added a v-neck in a deep purple I might be able to take the look to the next, more sophisticated, level. Sartorial inspiration from Uncle Monty! Whatever next? Thank you and welcome Mr. von Simson, I look forward to your comments and what you have to teach me! Athenaeus, brilliant combination. I, too, like lavander ties and wear two with some frequency. If you check around the archives you will find me in one with a white vest. Fairfax, I love to laugh. It was the caption that got me. Thanks! Sir Fopling, one finds inspiration in the strangest of places… and I never rue the day. ….all that and a chin too ! A perfectly elegant combination, and especially like your choice of tie, which, I would agree is very well knotted. Smashing.